Gel Protection Series is a gel-based protection in its third generation. Lighter, more adaptable and yet with the same high quality protection factor and absorption rate. Not comparable with gel pads on the market that either offer low protection or a cumbersome adaption. Not comparable with foams of any kind that are unpleasant, absorb the incident power inadequately and so pass on to the body or become hard and brittle. Enjoy the best: comfortable protection which keeps you powerful and ready for action as an athlete by protecting the most important thing: your body! This is our flagship of neck protection for goalies. 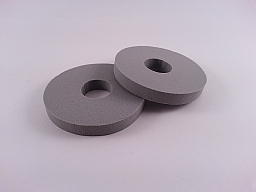 With superior protection from impacts and cuts, our standard Combo clavicle pad is 25,5 cm (10") in length from edge to edge and 10 cm (4") in height from edge to edge. We offer different collar heights, notch cutouts for more neck clearance, and we also offer several modifications aimed at covering the area left exposed by the neck line of your particular chest & arm. Ideal for entry-level for goalies into the world of Maltese Sports products, which are lightweight, flexible, adaptable and offer real life protection! The next level of our Combo: The Reiter Specs combine all possible extensions of the combo (clavicle and sternum) and optimize this in addition in terms of fit and comfort. This means concretely: Better clavicle protection, better coverage of critical body regions and additional sternum protection compared to the standard combo. Better protection = more material and thus more weight and limitation in the motion. The Reiter spared you from this. Our GPS Collar features the same protective materials used in the goalie GPS Combo, while being aimed at forwards who require protection from impacts and cuts. It does not feature the clavical pad associated with the GPS Combo, but has an available option for a bib (pictured). Adaptions, such as a DIP (U-cut), the collar height and customized colors are possible. The own printing we offer for a distinctive neck protection. Neck-Protec yourself ... with style! 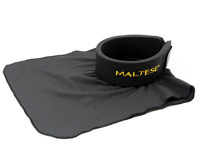 New since 2013, Maltese Sports introduces our latest product, the KTPs - Knee- /Thigh Pads. 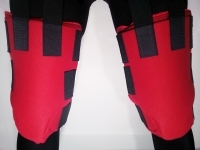 After years of research and development in the knee pad department and based on the success of our GPS products, specifically, our neck protection, we have, what we feel is the ultimate knee protection. We use three layers of our air frothed gel to make the most comfortable, mobile and protective knee pads. But we didn't stop at the knees, we went higher to protect the thighs too. As always, no hard parts used, so landing on these "stand alone" protective Knee/Thigh Pads (KTPs), will solve rock hard landing gear pads as well as missing your landing gear altogether. It's when you take a puck to the knee/thigh area and you don't hear a noise and don't feel a thing that you'll come to fully appreciate these pads from us. Goalies often complain that their knee pads of choice prevent their pads from rotating, but ours are very low profile and do not cause those same rotation issues. Our first mass distributed item to NHL teams. These pads have gone through three incarnations as our materials evolved, and just like the rest of our lineup, the Lace-Bite Pads feature reduced weight while offering the same amount of protection. The pads prevent lace bite via a simple appliance to use. While your skates are on, but not laced up, you place the pad (velcro dot in direction to the tongue) against the affected area; bring down the tongue and lace as per usual. When you unlace your skate and take it off, the LBP stays on the tongue (depends on the inline material of the tongue). No more looking for your lace bite pads for each skate session! Similarly to our LBPs the ankle pads addressed to a much more difficult part of the foot. A concept fo the ankles area, it prevents pressure points, but they also stabilize the grip in the skates. The ankle pads support you. Especially Defender know that: outside, you could need a little a more protection sometimes - whether shots or strokes. Our APs suited for this as well. These are not your typical terry cloth sweat bands with a curved piece of plastic. 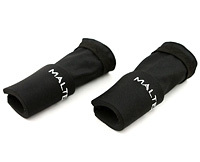 These guards cover that area between your glove's cuff to the bottom of your elbow pads with our Maltese Gel. The coverage is approximately 300 degrees and comes with a neoprene cuff that fits under the elbow pads to prevent slippage. This is ‘it’…the padding that will change how masks are finished off. Say good-bye to ineffective materials like Rubatex, EVA, EPP and anything else that is NOT gel. Our gel has an effective operational range of -40 degrees to 200 degrees. It is 100% hypoallergenic. The gel immediately rebounds to provide the same level of excellent attenuation for multiple sequential impacts. This gel appears to be foam, but do not mistake it as such. 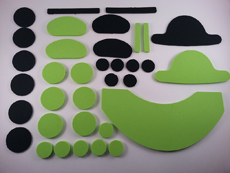 We offer two thicknesses in the kit. 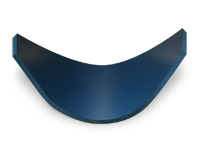 The blue is 0,65 cm (1/4”) thick and the gray is 0,32 cm (1/8”) thick and self adhesive so it can be married to the blue (provided you’ve cleaned it well) wherever you may need the gel to be thicker. The attenuation properties of the gel mean you can use a thinner padding, which increases overall visibility, while increasing your protection. You will find more informations in our Media Center! Our GPS Chin Slings are a new option for goalies, filling the need for goalies who prefer the feel of a sling in their masks. This item will be delivered with the GPS Mask Padding Kit, but we now offer it as a standalone item for those who wish to upgrade the classic chin pad.